We’re back!!! What an amazing week and a half. 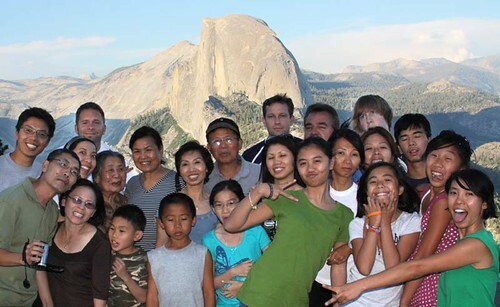 My extended family and friends (all 22 from 3 states) traveled close to 2000 miles driving from Los Angeles to Yosemite and then to Grand Canyon and back. We saw some amazing sights, shared great memories and experiences, and of course, had some great food along the way. Unfortunately we weren’t able to document everything we made but we’ll slowly post some of the trip photos along with some of our food posts in the near future. 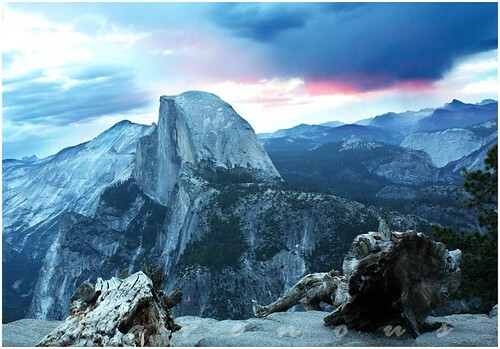 View of Half Dome from Glacier Point. It pays to be up at 4:30 am. Because everyone was arriving to Los Angeles late in the evening, Kim decided to make a family favorite soup Bun Thang (pronounced with a hard “t”) for my family to eat after a long cross country flight—talk about PRESSURE!!!! It was also going to be the first time she met my parents and grandmother! During the summer time growing up, my mom frequently made Bun Thang, a mien bac (northern) dish from Hanoi, because it’s mild flavors are so light compared with traditional bun bo Hue or Pho and very easy to prepare. My mom doesn’t really know the origins of why they call it Bun Thang, and I couldn’t find anything about it in a web search so we’ll appreciate any input from those more knowledgeable. Bun thang is not available in every Vietnamese restaurant but it’s really simple to put together. 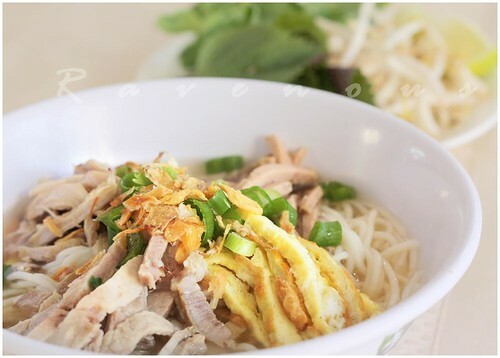 It is comprised of Vermicilli noodles, shredded chicken, thinly fried egg, and cha lua (Vietnamese ham/sausage) in a pork and chicken broth. Some recipes also added dried shredded shrimp. To make the stock, add pork bones and cover with water and bring to boil for about 2-4 minutes. Empty the water along with the gunk and residue and save bones in colander. Clean bones, rinse well, and drain. Also, clean the stock pot before adding the bones back in with about 12 cups of water. Add shallot and chicken and bring to rolling boil and reduce heat. Remove chicken after about 20 min to 1/2 hr (depending your the cut you use and how big) and cover with saran wrap and set aside to cool. Continue to simmer the broth under low heat for about 2 hrs, skimming off fat, froth, and any residual gunk from the broth. Then add, a few dried shrimps, sugar, fish sauce, and salt to taste. Scramble about 3 eggs in a bowl and using the largest nonstick skillet you have, pan fry a thin layer of egg until slightly golden brown. Remove from heat and set aside. When cooled, slice thinnly about 3 inches in length. We prefer as thin a layer of egg as possible. When the chicken cools, hand shred the meat, removing any excess fat and skin. 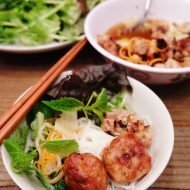 Cha Lua is a classic Vietnamese ham/sausage made from lean pork. Slice thinnly, matchstick size. Boil one package of vermicelli noodles, drain in colander and set aside. Other optional items might include shredded shrimp and some additional thinly sliced pork. chopped rau ram (Vietnamese Coriander). substitute with cilantro if not available. Other optional herbs include bean sprouts, perilla, mint. Ladle broth over bowl of vermicelli and top generously with shredded chicken, cha lua, and thinly sliced fried egg. Garnish with chopped Vietnamese coriander, green onions and fried shallots. Serve with lime wedge, bean sprouts, perilla, mint, and sambal chili paste on the side. My family loved it and all gave Kim 22 big thumb’s up–including my mom and grandmother who can be hard to please!! Gastronomer: Mild it is, and we love it for breakfast or a late night snack…as it doesn't leave you overly full, but flavorfu enough to satisfy. Anh: Yes, it's a great way to use left overs! Your commentary of Hanoian cuisine is spot on. I've got to say, I've never tried this dish before! Great job to Kim for impressing your family! Jackie: It was a long drive, but totally worth it! 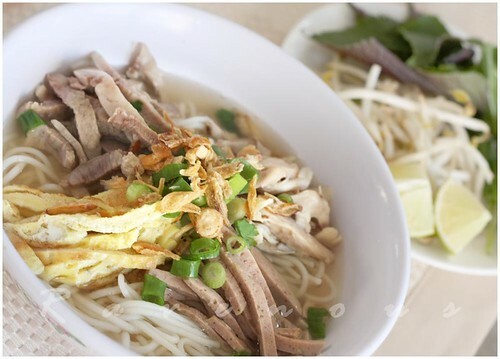 Krissy: It's very popular in Hanoi and you occasionally see it in some restaurants in OC. As we've mention, it's mild and clean flavors. She actually bought all the groceries and made all that food in less than 2 hrs, after flying in from out of town herself! I love soups. This one has a great combination of flavors. Fried egg is so delicious on anything. Bun thang is my favorite noodle soup with some shredded cabbage and fresh cut chilis for spiciness.!! i love your blog, keep it up! And about your family: Wonderful!!!! hummingbird: Thanks! The fried egg definitely add some nice flavors. Susan: Thank you for the suggestions. We'll keep it in mind for future posts. Bun Thang ROCKS! it's definitely my chicken soup for the soul. I love adding a dollop of shrimp paste and 2 drops of Mangdana Essence. I'm getting hungry now! readyto: Thanks for the suggestions! shrimp paste would be a good addition. Some recipes do call for dried shredded shrimp as well. Great recipes!! easy to follow, I cook them up today:) very yummy…..
Phuong Thao: so glad you liked this bun thang recipe! Try bun mocsince it's really similar! Just had a chance to try bun thang today. Loved the flavor and tasted very familir eventhough that was my first time trying it. One thing that surprised me was the size of the bun. It seems to me that the bun used in bun thang is smaller in diameter than the bun used in bun bo hue. Is that right ? In the restaurant menu, it was under 'bun' together with bun bo hue, etc. Awww, Bun Thang is my childhood favorite! Thank you so much for posting this. I'm going to try. I remember following my mom to Hang Be market in Hanoi and eating it sitting on a little plastic stool. Bun Thang is actually not mild flavor, I often think of it as the Northern's equivalence to Bun Bo. One essential ingredient is a little dollop of mam tom (shrimp paste), added to the bowl just right before you pour the broth in – that's what adds the kick and completely enliven the bowl of bun. I think Lee Kum Kee does a good shrimp paste. There's one theory (my family's, headed by an herbalist doctor/apothecary) that it's called bún thang because when making the bowl, you take pinches of all the different ingredients, similar to when you are assembling a herbal medicine prescription (thang thuốc). There's another that says "thang" comes from the Chinese word for soup, also Tang in Korean. 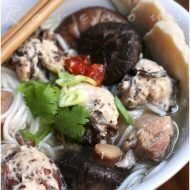 So bún thang would be soup made w/ bún. I like the first theory more and occasionally make bún thang w/ black broth to play on that association. We recently saw on a Vietnamese academic listserv that "thang" is Sino-Vietnamese for sliced thinly, hence all the items in Bun Thang are sliced thinly. Of course, this is just another theory. We love your site! 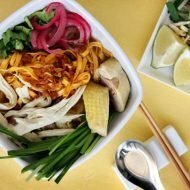 We recently relocated to Vietnam with a 6 month old and since most restaurants are not baby friendly, we're trying our hand at cooking all our favorite dishes. Your recipes have been a great starting point. Just tried the Mi Quang recipe and enjoyed it immensely. Bun thang and bun thit nuong (hanoi style) are my favorite dishes. I grew up eating this on special occasions. The mild broth along with the rau ram (Vietnamese mint?) really make the dish. We also had shredded dried shrimp (as mentioned) and salted duck egg yolk as a topping to go along with the shrimp paste. In fact I made a bastardized version today with chicken stock with broth, dried squid, dried shrimp, green onions, and yellow onions. Turned out pretty good even though we only had egg and cha lua. I can’t get this in the restaurants around Central Florida, but good thing it’s easy to make. As long as I have the rau ram, I’m good.